Restoring faded color slides and transparencies. Here is a faded Kodak Ektachrome 4×5″ color transparency taken September 13, 1952. It shows Indians fishing at the long-gone Celilo Falls on the Columbia River sixty-five years ago. The colors have faded leaving a strong reddish-magenta cast. I made a drum scan of the original film and this is exactly what it looks like. This is my basic color corrections made using Photoshop. I started in curves with a white balance eyedropper on a specular highlight. Then I went to color balance and reduced the magenta out of the shadows, mid-points and highlights. That gave me fairly good tonality but it was too greenish. I used the hue control to get the sky looking right, then back to curves to fine-tune the color. The result shows good skin tones on the people, and the sky and water are logical & natural appearing. Most peoples clothes are believable. The only giveaway is the deepest shadows in the rocks which have a slight magenta cast. I could take care of that with a black eyedropper in curves, but the result is too drastic. Experience has taught me to quit while I’m ahead. All of the work done on this picture was global; I didn’t do any local color control. This restoration was a sequence of about seven separate adjustments done in a particular order. It took a couple of tries to get the recipe right. I probably invested about fifteen minutes of time into this. The photographer is Hugh Ackroyd (1913-2012) and this is a copyrighted photo. This doorway is presently the entrance to Stumptown Coffee Roasters, at 128 SW Third Avenue, between Ash and Pine. 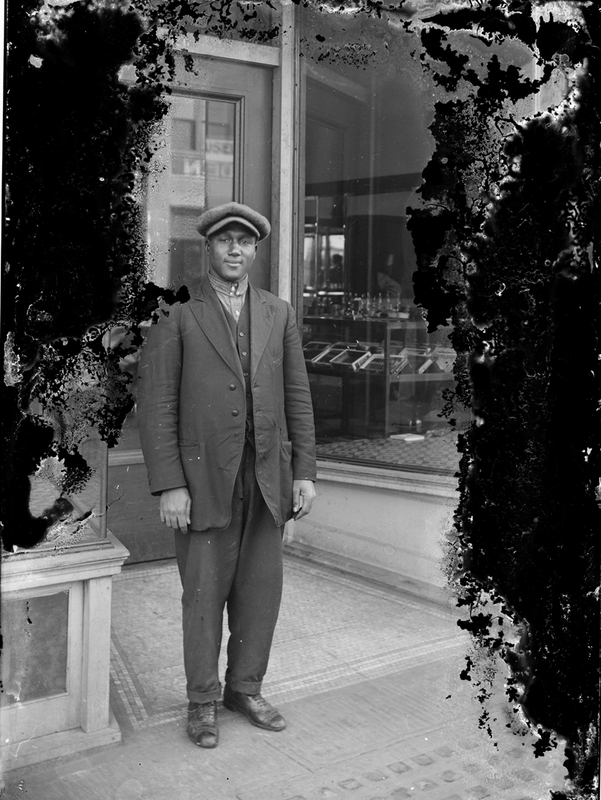 In 1915, when this picture was taken, it was Tony Gasola’s Cigar store, 26 Third Avenue. The address changed when the street was re-numbered, and the boundary between SW and NW moved from Ankeny to Burnside, in 1933. This tantalizing image was first shown twenty years ago in the exhibit A Portland Family Album; Self-Portrait of an African-American Community. Christopher Rauschenburg, Richard Brown and I, along with an army of helpers, produced the 115-print show, which, because of its size, was co-hosted by the Blue Sky Gallery and the Interstate Firehouse Cultural Center. This month, I’m digitizing the collection to put on the Blue Sky Gallery website. The source of this image is a glass plate negative, taken by an Oregon Journal staff photographer in the fall or winter of 1915-16. The plate had been in a flood and lost about a third of its emulsion. Over the last twenty years I’ve often wished that the location could be identified. The best clue was the street number address above the doorway, which was “26”. Last week, I checked the 1915 Portland city directory’s classified business listings for cigar stores. There was only one cigar store with that address in the areas of downtown using glass blocks in the sidewalk cement that you see in this photo. These were called Vault Lights and were used to illuminate basements with natural daylight. Most nineteenth-century downtown buildings had hollow sidewalks with cellars beneath. Vault lights had, in many cases, prisms on the bottom side to direct the light around the basement, illuminating every corner with daylight. For scanning glass plates, I’m now using a scanner mounting fluid to cover the emulsion (with a mylar overlay on top to prevent the fluid from evaporating, which otherwise it would do in a matter of seconds). The fluid greatly reduces refraction and bruises in the emulsion; the result looks almost like the picture was taken yesterday by a digital camera. For the rest of the exhibit, sometimes I still have access to an original print and I’ll scan that, otherwise I’m drum-scanning the copy negatives I made to print the 1995 exhibit. Portland’s Jitney industry dates to 1915 when, in many American cities, any person with an automobile was free to travel along trolley lines ahead of the street cars to pick up awaiting passengers and collect their fares. Jitney’s were named after the then-current colloquial term for a nickel. 5¢ was the standard trolley fare on the west coast, and thus became the Jitney fare. The Jitney bus originated in Phoenix, Arizona, during a trolley carmen’s strike. The first two began operating June 29, 1913. A little over a year later, about October 1914, a man who had observed the Phoenix Jitneys followed suit in Long Beach, California. A flock of others followed him. Almost overnight, the epidemic spread to Los Angeles and San Francisco. The afflicted trolley companies said they were being dealt a “solar plexus blow” by Jitneys carrying capacity car loads on their tracks. The “Jitney Panic” struck Portland in early 1915. In Portland, the first legal strategy to be explored to control them was by the City Attorney, who considered whether Jitneys placing a placard or sign on their vehicles made them subject to Portland’s license ordinance. A $10 fee was required for soliciting on the streets, but the term soliciting had previously been interpreted as calling out by voice. No action was taken. Jitney drivers worked the short haul lines of close-in residential districts to downtown and back, usually going no more than two miles per fare. President Griffith of the Portland Railway, Light & Power company said in a speech before the Transportation Club at its annual dinner on January 17, 1915, that the trollies needed the revenue of the short haul passenger to pay for the long haul service. He explained that a variable fare based on mileage would cost more to implement than it would earn. He also pointed out that the city earned practically no revenue from Jitneys, but that the trollies were paving streets and paying 20% of their gross income in taxes. But President Griffith’s pleas to Portland City Council fell on deaf ears when he testified before them the next day, on January 18th. Apparently, no consensus could be found amongst the members. One of the commissioners suggested using all city-owned vehicles as Jitneys, and to turn that revenue into the city’s general fund. The first regulation of Jitneys in Portland began a week later, when a judge issued 50 warrants for motorists, all Jitney drivers, who drove between standing street cars and curbs. They were fined $5.00 each for such conduct. One driver was arrested for the third time in two weeks for driving a car between a street car and the curb while passengers were de-boarding. Witnesses said an elderly couple narrowly escaped being struck by the Jitney, and the judge fined him $20. That same week the largest Jitney bus company in Portland asked the City Council to regulate Jitney service, by requiring a bond to the city. The company had invested in a small fleet of ten-seat busses and were complaining that individual owners were waging a war against them for their customers. Council was less than sympathetic to the ironic pot-calls-kettle-black request. Council upheld their previously stated philosophy of not siding with either the trolley or Jitney interests. At that time, the majority of individually owned Jitneys were second-hand, four-seated vehicles (not including the driver). A factory was built in Portland to manufacture 20-seat Jitney buses built onto Reo brand trucks. Their prototype cruised Alberta street in January, 1915, and they immediately set out to manufacture another 14 of them. In only a year, Jitneys revolutionized transportation in Portland. There may have been 400 cars running by February. The controversy surrounding Jitneys was widely debated in local clubs, civic groups, and the press. The losses of the trolley companies appeared likely to result in service reductions to outlying areas or increases in fares. Real estate and construction companies needed trolley service to neighborhoods. Most outlying neighborhoods, Sellwood for example, had sidewalks on most residential blocks, but the streets weren’t paved. During the rainy season the streets were largely impassible to automobiles, so trolley service was essential. 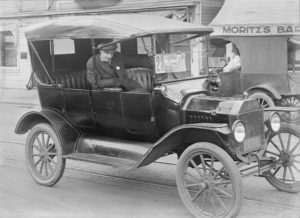 The first woman Jitney car driver was Mrs. Jennie Riemann, who drove her own car from 10AM to 10 PM from Second and Washington streets to Twenty-third and Thurman. She began driving January 25, 1915. On her fourth day of driving, her 5¢ fares added up to $19.25. 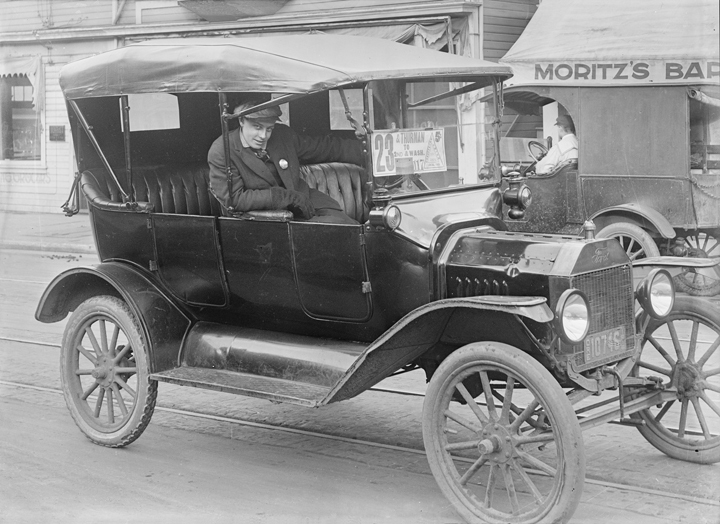 The first regulations applied to Jitneys was announced by Mayor Albee, who declared that a new ordinance regulating taxicabs, passed on February 1, 1915, applied to Jitneys. On Friday, February 5, Mayor Albee instructed the police to enforce the taxi ordinance provisions to Jitneys. The regulation limited overcrowding. It was common for passengers to have to sit in each others laps, or stand on the running board, which would obstruct the rear-view mirrors. It also prohibited drivers from smoking. The Carmen’s union presented a petition protesting Jitneys with 14,000 signatures to the City Council. Meanwhile, the trolley company itself became more competitive to combat Jitneys. It changed its routing to offer more trollies, eliminate layovers at the end of the line to get the trolley back in motion as soon as possible, and ran later hours. Not to be outdone, the Jitney drivers formed their own political organization, the Auto Transit and Welfare Society. On February 8, they signed an agreement with the City of Portland that they would regulate themselves. The city agreed it would not take any new actions for a period of sixty days while the new rules were being tried out. At the same time, the Oregon Senate was considering three bills regulating Portland Jitneys. The Auto Transit and Welfare Society testified against the bills. The city tried a scientific experiment to measure the profitability of a Jitney. The City Engineer drove Mayor Albee’s personal car for a day and a half on Washington and Thurman streets. The report found that a driver could make $1.76 a day profit after all expenses. Taxation of Jitneys was one of the policies being considered at the time. Jitneys were becoming part of popular culture. In the cinema was Charlie Chaplain starring in “A Jitney Elopement”, which came to Portland theaters in March, 1915. In the anarchistic world of Jitneys, altogether new crimes cropped up overnight; Drivers were robbed at knife or gunpoint — and in Portland one driver was killed; Jitneys were hijacked and then subsequently used to rob passengers or commit other crimes; pickpockets harvested wallets and purses; one policeman arrested a Jitney driver for ‘joyriding’ after he noticed the same two females and one male in the same car for over an hour — they were found to be tipsy. The police had the ladies’ husbands come down to the station to pick them up. The streetcar conductors and Jitney drivers were at virtual war with each other. Tacks had been found on the road next to tracks in Seattle, and it was suspected that Carmen had placed them there to flatten the tires of Jitneys. About a week later, tacks were found on a Portland street by the City Engineer. Reporting over the next month shows that Police arrested many Jitney drivers at the behest of the Carmen, and the Jitney drivers had a few Carmen arrested for driving infractions. Hearings about Jitney regulation before the City Council dragged on for three months as the ordinance regulating Jitneys was debated. The law was passed on April 2nd, 1915 and took effect one month later, on May 3rd. The law was long and detailed, but the main features are that each driver must pass a test to get a permit, must have their car inspected, must select a route and not leave it and must operate a certain schedule each day. However, that ordinance was put on hold because the Carmen invoked a referendum, which automatically placed a two-year hold on it taking effect. The City Auditor then placed the law as a ballot measure to let voters pass on in the June, 1915 election. On June 8, voters passed the measure regulating Jitneys. The vote was Yes: 6033; No: 4216; majority for: 1817. Uber started its Portland service a hundred years after the Jitney War of 1915. Although there are many differences between Jitneys, Taxicabs and Uber, the fact remains that Portland is no stranger to drastic and unpredictable disruptions in transportation caused by changes in technology and opportunity. Morning Oregonian, January 6, 1915 page 9, columns 3-4. Morning Oregonian, January 9, 1915, page 3, col. 2. Were portions of Martin Luther King’s ‘I Have A Dream’ speech delivered a decade beforehand in Portland? This posting has been corrected for errors of sequence and fact, I appreciate the comments and information. 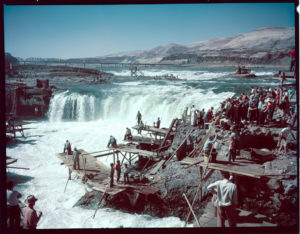 Photo taken February 14, 1953. 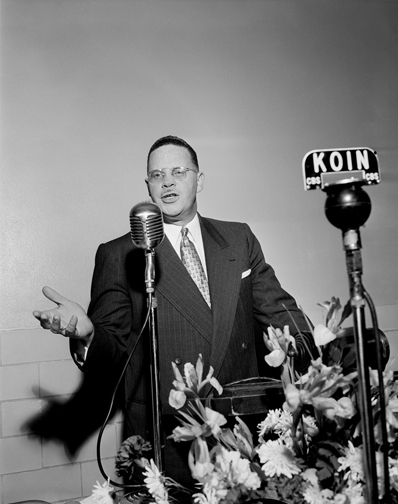 Archibald James Carey Jr. (1908 – 1981) speaking in Portland at Lincoln High School on Lincoln day. He was a Black American lawyer, judge, politician, diplomat and clergyman from the south side of Chicago. Carey was also King’s longtime mentor and friend. 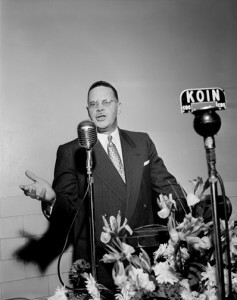 Seven months before the Portland speech this photograph shows, Carey was a keynote speaker at the 1952 Republican National Convention, and that speech is considered to be the seed of many of the sentences that Martin Luther King used in his “I Have a Dream” speech. For comparison, this is what Martin Luther King said in Washington DC on August 28, 1963: “This will be the day when all God’s children will sing with new meaning “My country ’tis of thee, sweet land of liberty, Of thee I sing. Land where my fathers died! Land of the Pilgrim’s pride! From ev’ry mountainside, Let freedom ring!” And if America is to be a great nation this must come true. So let freedom ring from the prodigious hilltops of New Hampshire. Let freedom ring from the mighty mountains of New York. Let freedom ring from the heightening Alleghenies of Pennsylvania! Let freedom ring from the snow capped Rockies of Colorado! Let freedom ring from the curvaceous peaks of California! Let freedom ring from Stone Mountain in Georgia! Let freedom ring from Lookout Mountain of Tennessee! Let freedom ring from every hill and molehill of Mississippi. From every mountainside, let freedom ring. None of this was written in King’s prepared text of his speech. Halfway through it, Mahalia Jackson, a gospel singer and good friend of King’s, shouted “tell ‘em about the ‘dream.” From this point in the speech, King stopped looking down at his notes and improvised. It is likely that Carey’s use of the mountain metaphor, which he used at the Republican National Convention seven months before his speech in Portland, and was later used by King in 1963, was heard in Portland in 1953. It is interesting to note how the Republican party changed so dramatically in the 1964 election. Since the time of Abraham Lincoln, the Republicans had been the leaders in Civil Rights legislation for Blacks, and for American Indians as well. Locally, Senator Mark Hatfield participated in many Civil Rights activities. This all changed during Kennedy’s administration, and many Black voters left the Republican party during the Goldwater/Johnson election in 1964, which Johnson won, and resulted in the Civil Rights act’s passage the next year. Since then, the Democratic party has led Black Civil Rights legislation, and the Republicans inherited the Southern White votes. It is likely that KOIN broadcast the Portland speech, judging by their microphone, but I’m unable to track a recording or transcript of it today. Photograph by Allan deLay (1915-2005) and ©Thomas Robinson. Reproduction prohibited without written permission. Wikipedia entry for Carey: http://en.wikipedia.org/wiki/Archibald_Carey_Jr. The group of glass plate negatives that I’m working to identify now is the work of a photographer who ran a photo tent in a traveling circus. Most photographs taken at circus photo-booths are direct positives, such as Polaroids, and for those there are no negatives. Back then, direct positives were called tintypes. Negatives would be taken only if a dozen or more prints were wanted. The glass plate negative collection contains, as one might imagine of a circus, a lot of random images, as well as actors in the circus and events, and there are a few wagon repair shops. 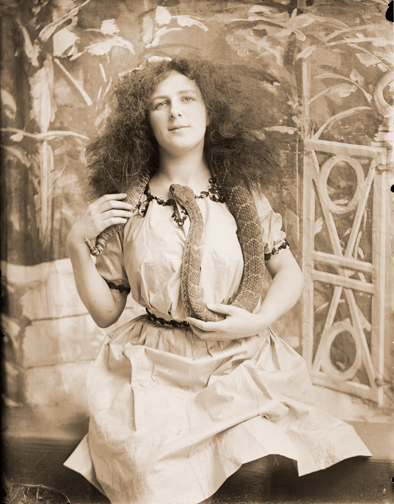 This portrait was obviously taken to make souvenir cards for the snake charmer woman to sell at her tent. Good clues abound within the images; the lettered signs appearing on the photographer’s backdrops stated the year and location. They indicate that the circus travelled along the Oregon Coast in 1909 from Brookings to Seaside, and then on to Portland. Online newspaper archives that are electronically searchable provide research tools to historians that were previously unimaginable. I use the University of Oregon and Multnomah County Library historical newspaper resources every day to identify photographs. I’ve become used to expecting the unexpected, but sometimes the information I find is so far from what I conceived logical, that I regret even looking for it in the first place. Further information was forthcoming, but as I mentioned, it was not what I had thought it might be. The next mention of her in the press was her obituary, which appeared two years and two months later, in August 1911. The obituary identified Zena as Grace Moreland, who was born and raised in Tillamook. She was twenty years old at the time she suicided at the Iberia hotel in Boise, Idaho. According to the circus director, Professor Miller, in comments he said to the press following her death, she had been with the circus for three years. She had a boyfriend whom she was engaged to marry, J. W. O’Donnell. Newspaper accounts said he was the balloonist who operated the hot-air balloon rides. When the circus arrived at Weiser, Idaho, in June, 1911, at a spot next to the Snake river, something went wrong in the balloon and he attempted to parachute out. The parachute ropes became entangled in his neck and he landed in the Snake river and drowned. His body was found the next day in Huntington, Oregon, 22 miles downstream. Grace Moreland fainted upon hearing the news of her fiancé’s death. Professor Miller said “they were like brother and sister”. Two months after the death of her fiancé, Grace Moreland attended a dance at the White City in Boise, Idaho, and subsequently went to her hotel room and took a fatal dose of chloroform. She left a few letters and was found clutching the bottle of poison. It was left to the Boise coroner to administrate her personal effects; which primarily were 22 snakes. This is an amazing story of an Oregon woman. According to newspapers, she had no family members left excepting a grandmother in Portland. Grace Moreland led an itinerant and independent lifestyle a decade before women had the right to vote. I admire the fortitude, entrepreneurship, and independence of Grace Moreland. 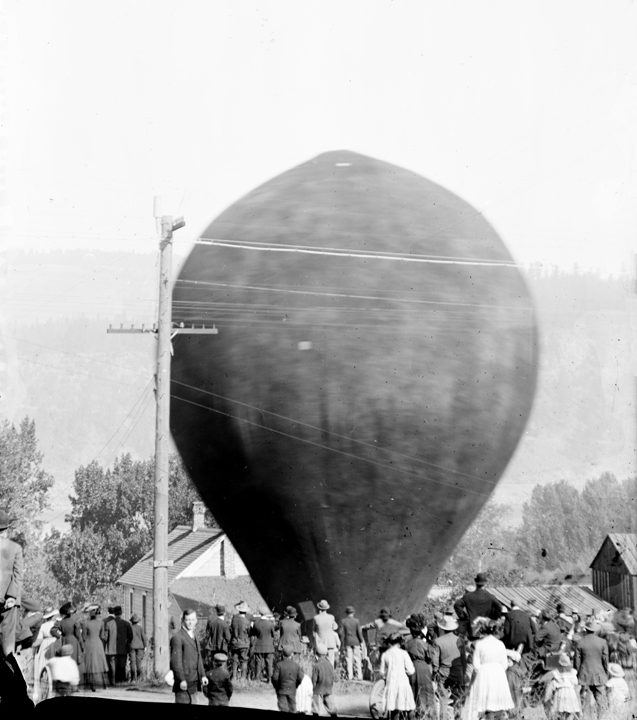 From the same collection of negatives, Carnival Balloon on Cascade Ave, Marshfield (now called Coos Bay), Oregon 1909. Sources of information: Daily East Oregonian, Saturday August 19, 1911, page 5, col. 3; La Grande Evening Observer, Thursday, August 17, 1911, pg. 6, col. 1-3; Lake County Examiner, August 31, 1911, pg. 6, col. 4; The Morning Oregonian, Thursday August 17, 1911, pg. 2, col. 3; and Friday July 16, 1909, pg. 11, col. 2.